Oh, those glasses on thin legs! One awkward movement – and now a tablecloth or a white shirt "embellished" wine stains, which is not always possible simply to wash. How to remove stains from wine, not damaging the thing? If you have just spilled wine on your clothes or on a tablecloth, and the stain has not had time to dry – it can bring water to boiling, watering the stain with water from a kettle or wash in very hot water. Therefore, if you immediately, without delay, sent damaged item in the washing machine and set the water temperature 80-90 degrees, no additional measures for removing stains from wine , you do not need. Unfortunately, this method is suitable only for light linen or cotton fabrics. What to do with all the other things? A fresh stain from white wine can be removed with ordinary ice. Simply wipe the fabric with a piece of ice up until the stain is gone, then wipe the stain with a dry napkin or cotton cloth. If you did not have ice, asterite spot in a very cold, icy water. Fresh stains from red wine it is also easy to remove. Enough to handle their three-percent solution of ammonia or a solution of ordinary baking soda (one teaspoon of soda in a glass of warm water), how to wash the fabric in lukewarm water and wash with soap and water. From spots remain and a trace. Less rapid, but the same effective method of removing wine stains – pour has not yet dried stain table salt and leave for about half an hour then rinse and wash the cloth. White fabric stained with wine, you can also soak before washing in milk. Remove cloth old wine stains you can use citric acid. Dissolve in a glass of water 2 grams of citric acid, treat the stain with this solution and rinse well with warm water. If after removing stains on white fabrics remained a pale blue or purple traces, wipe them with a solution of hydrogen peroxide and ammonia (one teaspoon per Cup of hot water), then rinse in cold water. 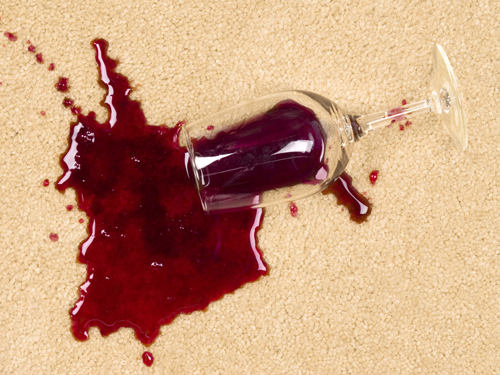 Of these methods, you can not only remove wine stains, but also stains from juices, fruit or berries.